Members of the Upper House should be “pick-of-the-society”; only those allowed becoming senators who are political equivalent of Saints and Sages. Bicameral parliament, consisting of an Upper House or Senate and the National Assembly, is the product of parliamentary system of the democratic dispensation. In this system, it is the federating units (read: provinces) which opt to become a part of the Federation. National Assembly has provincial representations based on population; a larger unit having larger representation. In order to ensure that larger federating units do not impose their will, through legislation, on the smaller units, there is the Upper House which has equal representation of all the provinces. Thus, the Senate represents all those who are not represented in the National Assembly. 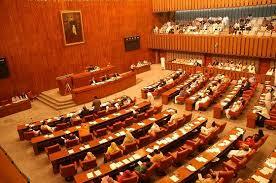 Senate was introduced through 1973 Constitution which replaced decades-long presidential rule in the country. According to Wikipedia, a senate is a deliberative assembly, often the upper house or chamber of a bicameral legislature or parliament. The name comes from the ancient Roman Senate, so-called as an assembly of the senior and thus wiser members of the society or ruling class. Many countries now have an assembly named a senate, composed of senators who may be elected, appointed, have inherited the title, or gained membership by other methods, depending on the country. Modern senates typically serve to provide a chamber of “sober second thought” to consider legislation passed by a lower house, whose members are usually elected. During the early Republic, the Senate was politically weak, while the executive magistrates were quite powerful. Since the transition from monarchy to constitutional rule was probably gradual, it took several generations before the Senate was able to assert itself over the executive magistrates. By the middle Republic, the Senate had reached the apex of its republican power. The Last Senate survived in Constantinople, until the ancient institution finally vanished there with the capture of the city in 1204. As the name and functions suggest, the members of the Upper House should be “pick-of-the-society”; only those allowed becoming senators who are political equivalents of Saints and Sages. The Senate of Pakistan is fighting the battle for its name and credibility and also its survival; its membership has become possible only for those who have neither prestige, nor honor nor sagacity; it is a house open to those who have filthy riches to be able to buy political sainthood. Does this mean that we have failed yet another democratic system due to sheer greed of our political operatives? This system has failed to throw up leaders, it has only thrown up crooks as political elite. How, then, about packing this up and replacing with the presidential form of democracy?